Highland Tank offers standard large capacity and customized propane vessels to accommodate an industry of evolving environmental and energy policies. With decades of steel tank manufacturing experience, the company’s propane vessels are engineered and fabricated to the highest standards in the industry. 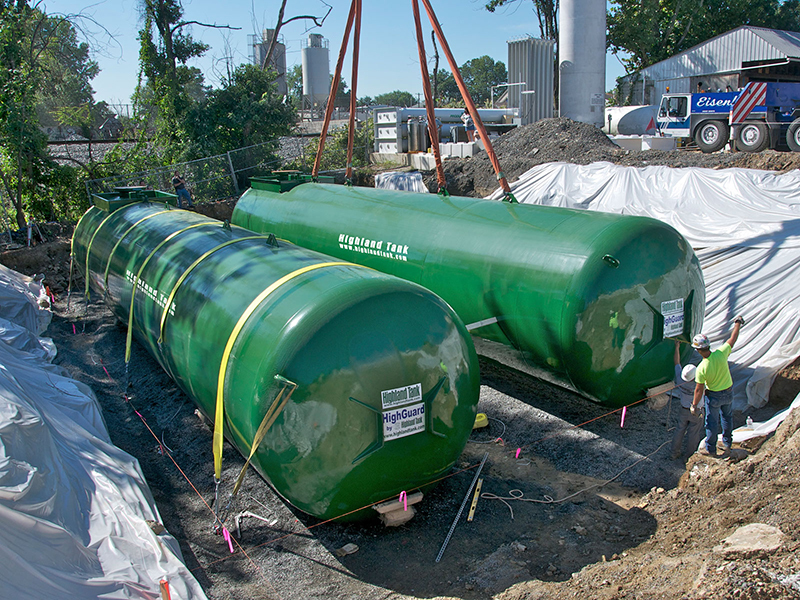 Highland Tank works closely with Somerset Planning and Engineering to provide complete turnkey propane solutions. Somerset Planning and Engineering provides project management services on the jobs offering permitting, design, site planning and installation. A strength Highland Tank brings to the propane industry is underground vessels which are coated with their HighGuard® protective coating. HighGuard® is a strong dielectric coating of high solids polyurethane for protection under even the most difficult conditions. The coating resists surface damage due to impact or abrasion that may occur during installation, and it protects the tank against corrosion. Unique to the propane industry, Highland Tank stands behind its HighGuard® coated underground propane vessels with a limited 10-year warranty. With space limitations on many properties, underground propane vessels are in demand. season. Once the snow flies, there is no way to get the fuel delivered to the peak. Competitors offered their standard 30,000 and 45,000 aboveground vessels. Highland Tank secured the project by offering underground vessels to shrink the overall footprint required. Plus, they made the installation significantly easier and far less expensive by providing custom-built 22,000 gallon vessels that we more suitable for the challenging delivery to the top of the mountain for the installation. In addition to offering custom propane tanks, Highland Tank also manufactures propane autogas systems. Autogas is a name for liquefied petroleum gas (LPG) when it is used as a fuel for vehicles. It is used as “green” fuel as it decreases CO2 emissions by about 25% compared to petroleum. Autogas use is on the rise in the United States with 2,843 fueling stations in operation throughout the country. Many public transportation systems are integrating autogas for the fuel cost savings and environmental benefits. Fleet operators whose vehicles are not traveling across country or state are benefiting from the use of autogas. Highland Tank recently provided turnkey solutions for a school transportation company and a large university. studies, the busses spent much time sitting still waiting for passengers to board. autogas system at the National Propane Gas Association show in April. If you plan to attend NPGA 2016, stop by booth 1119 to see how Highland Tank is working to provide solutions to an array of propane applications.